Road Rash by Mark Huntley Parsons. Review: Life in an awesome band isn't as awesome as it seems. 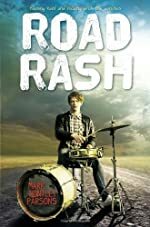 Road Rash by Mark Huntley Parsons has Zach Ryan, a gifted teenage drummer, as the main character. After being dropped from his band, a 17 year-old drummer, Zach Ryan, gets the chance to go on tour with the professionals. It feels great for him at first, but it becomes one tough time. He is in control of the drums, but off-stage the rivalries in his new group become hard to deal with. And the girl he left behind is now talking about another guy. Overall, I found Road Rash to be decent, but there are some aspects that made this book less enjoyable. One reason I didn't enjoy Road Rash was because it seemed like it was full of stereotypes. For example, the way characters text to each other in the beginning was stereotypical. The book had them texting common abbreviations such as "thx" for thanks, or "u" instead of you. Also, the overuse of swearing was unnecessary. It felt fine at first, but then it just became old and used more for shock than literary value. However, even though I didn't enjoy Road Rash that much, I'm sure someone a bit younger than me might enjoy it- without the swearing. Road Rash also had some aspects to it that made me enjoy it. One reason why I enjoyed Road Rash is that the book seemed realistic. While reading Road Rash, I felt like the story could have been real because of the character traits and storyline. All the characters seem believable. Another reason I enjoyed Road Rash was the storyline. I enjoy how things seem to be looking up for Zach, but then they completely backfire on him. Zach's life is going up and down. So in the end, Road Rash is a decent novel if you can get past all the stereotypes and unnecessary language. We would like to thank Random House for providing a copy of Road Rash for this review. Have you read Road Rash? How would you rate it?